Police in Nepal have used teargas in clashes with hundreds of protesters who defied a curfew for a second day to rally against King Gyanendra's rule. At least three people have been killed since police first opened fire on mass rallies on Saturday. They have been ordered to shoot anyone who violates the curfew in Kathmandu and other cities. King Gyanendra took power 14 months ago, accusing political parties of failing to quell a Maoist insurgency. The Maoists have declared a ceasefire in and around the capital and - for the first time in their decade-old rebellion - have promised to co-operate with opposition politicians. 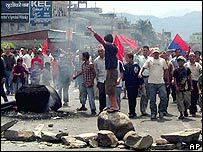 Protesters have defied curfew orders at several points around Kathmandu, attacking government property and setting up barricades of burning tyres. Police used teargas to disperse them and heavily armed soldiers and police were seen manning major roads and intersections in Kathmandu. 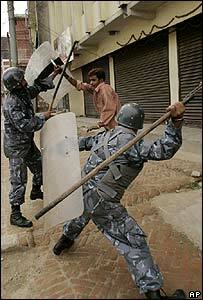 "We are not afraid of bullets," protester Prajwal Sharma told Reuters news agency. "We have to get democracy at any cost and we will get it." In back streets near a city temple, dozens of students burnt tyres and blocked lanes to keep out security force vehicles, telling the BBC they were tired of being kept away from their colleges. The latest death was reported in Banepa, a town to the east of the capital, where one man was shot dead as protesters clashed with police on Sunday. One of the day's biggest demonstrations was in the southern town of Bharatpur, where about 2,000 people vented their anger at the death of a woman. "Protesters rained stones on police and they responded by firing teargas," local journalist Narayan Sharma told AFP news agency by phone. Tulsi Chhetri was apparently shot by police on Saturday while sitting on her balcony near the scene of a mass protest. In the resort town of Pokhara, thousands of protesters tried to enter a hospital where the body of a man shot dead by soldiers on Saturday was being held. The army has said it opened fire to protect itself. Two more people were injured in Pokhara on Sunday as police fired either live or rubber bullets. There are also reports of the death of a woman during a protest in the town of Narayanghat. The demonstrations are taking place in the context of a four-day general shut-down called by opposition parties and due to end on Sunday. The strike has the blessing of Maoist rebels, though the parties insist the rebels are not directly involved in the rallies. Our correspondent says the authorities are clearly nervous and are having trouble controlling the protests. Hundreds of opposition figures and activists have been arrested since Friday, according to police officials. In the west of the country, Maoist rebels attacked security force bases and government offices on Saturday, leaving at least five people dead. Some 13,000 people have died since the Maoist insurgency began.